Mitsubishi Chemical Advanced Materials' stock shapes made of crystalline thermoplastic polyester, are marketed under the trade names Ertalyte® (virgin grade) and Ertalyte TX® (bearing grade). Ertalyte (colours: natural [white], black) is an unreinforced, semi-crystalline thermoplastic polyester based on polyethylene terephthalate (PET-P). The specific properties of Ertalyte virgin crystalline PET make it especially suitable for the manufacture of mechanical precision parts which have to sustain high loads and/or are subject to wear. Ertalyte natural (rods, plates) is available as a "Food Grade". Ertalyte TX (colour: pale-grey) is a polyethylene terephthalate compound incorporating a uniformly dispersed solid lubricant. Its specific formulation makes it a premium internally lubricated bearing-grade. Ertalyte TX not only has an outstanding wear resistance, but offers in comparison with Ertalyte an even lower coefficient of friction as well as higher pressure-velocity capabilities. Ertalyte TX excels under both high pressure and velocity conditions. It is also ideally suited for applications involving soft metal and plastic mating surfaces. Ertalyte TX is available in various shapes as a "Food Grade". It is also FDA, USDA and 3A-Dairy compliant. 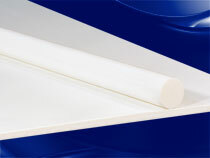 Because it is more rigid and offers greater thermal performance than Nylon and Acetal, Ertalyte machines differently. For best results, please consult us for machining details.